Gerald in Gerald + Keith. Photo by Robbie Sweeny. When I think about lineage, I imagine taking those DNA tests that reveal surprising details about one’s ancestry. I have never done this, but I suspect that results may be less revealing for immigrants of color than our white counterparts, especially those of us who have been naturalized and who no longer have deep connections to the homeland. As someone who came to this country at a young age, I possess a heightened awareness of my otherness — my appearance, my accent, and my actions all give me away as an outsider — as well as the strategies I employ to conceal it. Assimilation has always been a subconscious edict. Further complicating matters is the fact that we (Filipinos) have been colonized by numerous countries, so the colonial mentality is deeply ingrained in our psyches and subjugated bodies. Rather than harmonizing with the background, assimilation feels like blending in so as not to be registered as an alien — akin to camouflage. It has taken me years to cloak my Tagalog accent in order to sound “American,” or as some would say, to neuter my mother tongue. Imagining what my lineage would be through an ancestry site seems preposterous, since as an immigrant, I have long been trying to divorce my identity from my past while imagining what it would be like if I didn’t have to blend in. My already fraught relationship to (white) American culture is further complicated in the dance world: as a performer and a choreographer I am aware that I am always/already seen through my artistic ancestry. When people who know something about dance see me move through space, (I feel) they have assumptions about how and why I move the way I do, how I put phrases of movement together, and especially how notions of inherited movement affinities call into question with whom I have danced or studied. I question the focused squint of their gaze. Do they see my brown body first and then my inherited movement qualities? Or vice versa? My brownness along with my “en-corporated” kinetic identities cohere around a series of identifying markers that position my body as a unique colonial subject — one that bi-culturally assembles while simultaneously erasing itself though movement. Because I work in the lineage of postmodern dance, my brownness cannot be unseen through the white gaze projected on its white canvas. After dancing with Petronio for over twelve years (and assisting him with several commissions), I learned the quirky movement vocabulary, the intuitive improvisational skills, and coordination required to feel a sense of belonging in his hypersonic and dexterous choreographic world. As a dance-maker, it has been difficult to position myself within the continuum of embodied dance history and its associated hierarchies. I have tried to disidentify with my movement ancestry in an effort to assert my independence through my dances. This has taken a very long time, partially because of my penchant for and necessity to mimic. Sulcas was right when she said I was tired of the associations to Petronio, since it implies that my work cannot stand on its own. To be fair, she also wrote, “But Casel has his own aesthetic. His dances tend to be cool, almost formal exercises in shape and pattern, leavened by understated encounters between dancers that suggest muted emotional currents surging between them.” As much as I took this as an encouraging pat on the back, I still find it strange how dance critics feel the need to qualify the value of my work through the field of history. I wonder how long it takes for choreographers to molt their associative linkages from their relationships as dancers in other choreographers’ work. Does this function the same for white choreographers as it does for choreographers of color? While I acknowledge and honor my experience with Petronio (and his connection to Trisha Brown and her association with Judson Dance Theater), I feel an element of tension around it. That element is race. Most on the Judson genealogical path are white-identified. What happens when people of color interrupt this lineage? Black and brown immigrant bodies who mimic movements generated by white bodies produce a certain level of ambivalence since they can appear “almost the same, but not quite.” 1 White bodies are allowed to mimic any form since whiteness assumes a kind of unmarked-ness, while bodies of color are read through codes and metaphors that underscore racial phenomena which convey power and privilege only to certain groups. In the case of postmodern dance, how does the future adapt to changes in ancestral derivation? How do we address and reconcile race within the project of modernism? What comes after postmodernism? I extend this line of thinking to two recent performances at ODC Theater. In Grandma, Cori Olinghouse created a collage of bodies and objects, evoking a landscape of mnemonic debris that reflected her lineage to her grandmother. During a panel discussion a few nights before the performance, three women artists gathered to discuss their work to a small audience. Since she danced with and has been archiving the work of Trisha Brown, I was curious to hear about Olinghouse’s relationship to Brown’s movement vocabularies, especially since I, too, have an indirect lineage to Brown. I was surprised that Brown’s influence was minimally discussed. Olinghouse’s relationship to clowning, however, was prominently brought up, particularly her attraction to the work of Buster Keaton and Bill Irwin. Since she had been developing a practice she calls “clown therapy,” this makes perfect sense. In describing her work, she talked about absence, residue, and affect, and how she learned a dance by Keaton that she performs in the film Ghost line (2013), a project she co-created with filmmaker Shona Masarin. In Grandma, three dancers (including Hope Mohr, who also danced with Brown) wore bright pink outfits, white shoes, and the same blond wig to pay homage to the choreographer’s grandmother. Drawing on her excavation of the “American South as it connects with [her] personal family lineage,” Olinghouse and her collaborators performed a combination of clowning and satire that memorializes a time and place all through the imbued memory of her grandmother. Reminiscent of the self-portraiture of the photographer Cindy Sherman, Grandma conjures a movement portrait that contemporaneously embodies objects, subjects/detritus, and ephemera to depict not just an image of grandma but also the processed food-eating suburban culture that evokes the purpose of memorabilia, complete with static sounds from a dial-tuned television, Wonder Bread, and Twinkies. In this world, the personal collides with the universal — encapsulating Olinghouse’s anamnesis and the collective memories shared by Americans who grew up eating processed food and watching afterschool specials. I wonder how this work would be viewed, specifically as it relates to clowning, if Olinghouse were a person of color? Choreographers and performers of color do not have the luxury of choosing how they want to be seen. Since white performers’ bodies are presumed “neutral” and can assume any role they imagine, they can play roles that span a wide spectrum whereas bodies of color must always/only/already be read through filters and layers: first, through an ethnoracial context, and then through the subject they are working with. In Grandma, the movements and wigs made it difficult to determine the dancers’ ethnoracial identities. It is important to note that all three performers are considered as fragments of the same figure (a white, elderly, American woman), although one of them, Martita Abril, is Mexican-American. Abril’s identity is camouflaged through the movement and costume. In Paramodernities, Netta Yerushalmy facilitates, as she calls them, “a series of lecture-performances, or dance-experiments, generated through deconstructions of landmark modern choreographies, performed alongside contributions by scholars and writers who situate these iconic works and artists within the larger project of Modernism.” Yerushalmy brought excerpts deconstructed from iconic works by Vaslav Nijinsky, Merce Cunningham, and Alvin Ailey to ODC Theater under the auspices of Hope Mohr’s Bridge Project. During the Cunningham section, Brittany Engel-Adams and Marc Crousillat performed passages from Cunningham repertory in silence for a while, then with guest speakers Claudia La Rocco, Jennifer DeVere Brody, and Margaret Jenkins (who restaged Cunningham’s work between 1967 and 1976). At the end of the section the dancers began to speak — revealing their inner mental chatter to each other and the audience. They paused downstage center as if stuck in a time glitch, repeating a phrase over and over while audience members were invited to ask questions or offer observations. One question was: “Can you do the phrase on the other side?” After some finagling, the dancers successfully accomplished the task. I wanted to ask Engel-Adams (who is Black) how it felt to do the precarious balances on one leg with an afro. Since I have never seen a Black woman in Cunningham’s company, it felt like a germane question. I wonder why Merce never hired any Black women? By placing Engel-Adams in this Cunningham deconstruction, Yerushalmy probes the question by (re)presenting a Black, female body in this mostly-white world. It was lovely to see both dancers engage in this highly technical “mini-event,” especially to see Engel-Adams’s kinetic conjugation of the unadorned and sleek Cunningham vocabulary. This installment of Paramodernities placed a stone in the river of choreographic lineage. 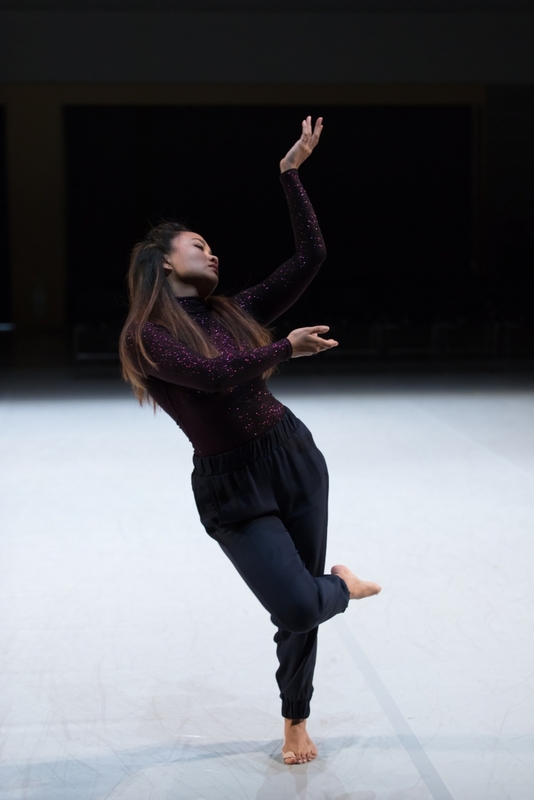 In the final section, Revelations: The Afterlives of Slavery, the writing and performance of Thomas F. DeFrantz takes this choreographic intervention further. On stage, DeFrantz shouted out phrases that resonate with me: “liquid modernity,” “black liquidity,” and questions such as “Can modernism be inflected Black?” His testimony to the legacy of Alvin Ailey asserts that dancers who identify as Black and queer can also have a home within the genealogy of modern dance. Inlaid against original text and Ailey’s Revelations (performed by Oluwadamilare Ayorinde, Stanley Gambucci, Nicholas Leichter, Engel-Adams, and Yerushalmy), we are met with DeFrantz’ refusal to be seen through a white theoretical framework. In scholarly writing, much of the referential work pays homage to predominantly white thinkers; to disrupt this process reveals the undercurrent of power and privilege within the academic status quo. Similar to my process of disidentifying with my dance lineage, DeFrantz creates a space for warranted recalcitrance. This section invited the audience to be spread around the performers so that we could see different angles and relationships between each body; we were also able to see each other, sitting in the round. Full disclosure: I am collaborating with Yerushalmy on the final installment of Paramodernities. Along with Magdalena Jarkowiec, we are working with George Balanchine’s Agon. As it is too soon to analyze this process, I can only offer a few bits of insight. Learning the Balanchine material, I am contemplating the performed and perceived notions of race, gender, ability, class, stature, and age, and how these elements can be foregrounded or hidden within ballet. Having never professionally performed ballet, I am learning a new movement language along with its aesthetic idiosyncrasies and presumptions. Since it is not part of my lineage, dancing Balanchine makes me feel outside of my safety net. There are moments where I feel I am able to fluidly slip between my taking on the effeminate textures I noticed had been choreographed for the Balanchine women and the forced masculinity inscribed in the male variations. However, there are times when I feel these idiosyncratic gestures are put on like costumes that don’t fit; the delivery of the steps, mannerisms, and gendered embodiment evoke in me a familiar, deep-seated ambivalence.. I can mimic the steps, but doing so induces great hesitation and self-consciousness, and I wonder how my performance of Balanchine will be read. Not only does this concern have to do with my personal history and relationship to mimicry and assimilation but also how these matters have always stirred up a heightened sense of ambivalence in me. There is no easing this tension: it is the dual legacy with which I will always live. Suzette Sagisi in Taglish. Photo by Margo Moritz. The two weeks with Diane Madden learning Trisha Brown’s Locus were incredibly illuminating, reminding me of my lineage and connection to Brown’s work. I have known Diane since the 90s, living in New York and taking classes at Susan Klein and Barbara Mahler’s school in TriBeCa, but most notably when we both were working with The Scottish Ballet in Glasgow. Along with Stanford Makishi, she was reconstructing Trisha’s For MG: The Movie while I was assisting Stephen Petronio with a new dance set to Radiohead called Ride The Beast. It was thrilling to watch the same dancers attune their highly technical skills within and beyond the realms of their classical training. I recall the way those classical ballet dancers walked and ran. This primal yet revelatory act contained physical traits that conveyed histories of training, philosophies of verticality in the spine, where the gaze began and traveled, and the use of weight and negotiation with gravity. More closely, it represented the multi-layered strata of culture and power that were invoked within the very act of moving through space with velocity and force. As I looked even closer, and through Brown’s extraordinary choreography, I saw gender, sexual orientation, age and experience, ability, class, citizenship status, access and privilege, race, aesthetics, and of course, the opposites or the absence of the very thing it aimed to conceal. Through dance, I look at power closely especially when there are assumptions embedded within notions of identity that perpetuate misunderstandings or (mis)readings of the body. This came up when the ten artists, selected by Hope Mohr and guest curators, started to learn about Trisha’s work through movement workshops and discussions. I noticed that all of us were coming from very different places and trying to get someplace where we can speak about our experience with Locus with a modicum of certitude about ourselves, our histories and lineages, and ultimately about our identity as we learned about and created a context for this seminal dance within our work. Diane would often begin our sessions by sensing the space with walking and with simple exercises that addressed our relationship to gravity. Speaking for myself, I arrived with assumptions about Brown and noticed that I placed the meaning of Locus within a very complex stew of postmodernist philosophy. I began to feel conflict as I unraveled what this meant, since in effect and through the years, I have embodied movement affinities and adopted compositional vocabularies that inextricably link me to Brown. I danced with Stephen Petronio from 1991-1998 and 2001-2005. Petronio danced with Brown for seven; he was the first male dancer in her company. When I joined Petronio, I learned and performed Middlesex Gorge, Simulacrum Reels, and Full Half Wrong Plus Laytext Complete, a reimagined version of The Rite of Spring, pulled apart from a collaboration with Michael Clark. During this time, I also saw the company perform Surrender II, a duet with Jeremy Nelson and Petronio and Petronio’s solo, #3, a dance that effectively conjured multiple famous personae that forced him to stand stationary downstage, front and center. Similar to Locus and through a rigorous structure, he was able to find expressivity and freedom inside imposed restrictions. These formative years created a foundation of my understanding of choreography and the power it can have as a force of rebellion. In a way, Trisha Brown, by way of the Judson Dance Theater – a group that revolutionized the way dance was being created and perceived during the late 1960s and into the 1970s – has a lot to do with this instinct to rebel. They were reclaiming the body from the way it had been treated by ballet and modern dance to represent itself and nothing more. By extension, Brown’s investigations inside the cube in Locus, were reaffirming the body as complete – just as it is – without subscribing to narrative, meaning, or metaphor. Through her work, Brown wanted to learn more about herself and how the choices she made within a structure formulated the ultimate freedom of expression. By imposing spatial constraints, Brown found a way to rebel against her own proclivities and habits. These constraints also enabled her to articulate a movement vocabulary that was formally pure and suggested the infinite possibilities for generating dancemaking. Formal constraints have the capacity to invigorate creativity, however, they do not function equally for all bodies. More precisely, there is no such thing as pure movement for dancers of color. In my view, it is difficult to separate structural and systemic power from race. Among other intersectional factors (such as age, gender, class, etc. ), dancing by brown and black bodies is read differently than dancing by white bodies. One of the assumptions that postmodern formalism arouses is that any body has the potential to be read as neutral – that there is such a thing as a universally unmarked body. As a dancer and choreographer of color, my body cannot be perceived as pure. My brown body cannot be read the same way as a white body, particularly in a white cube. This conflicted state rose to the surface during the workshops conducted around our learning the methodology of Locus. How was I to respond to this work without commenting on this tension that I felt? How could I highlight the differences my body represented rather than ignoring or erasing them? In recent days, I have been reflecting on the hierarchical structures that are present in the dance studio and on performance spaces and how choreography can be viewed as a colonizing force. I turn to colonization as a way to map the invisible power structures inherent within dance. Looking at a laboring/performing body is a way to understand how these powers lead to a re-inscription of assumptions, or worse, an egregious erasure of the body’s power to represent culture and identity. One of the faulty assumptions I had about postmodern dance is that it appoints essentially ambiguous conventions about the body – that the body is always free from narrative or metaphor. As I began to develop my response to Locus, I wanted to underscore that which was unambiguous. I wanted to highlight my ‘brown-ness’, the cultural markers that identify me as Filipino, and my queerness. So, with my collaborators, I turned to these elements as the source to generate this piece, Taglish. Taglish is slang for Tagalog and English collided together. Growing up as a naturalized immigrant with both languages, I was able to communicate fluidly with fellow Filipinos and new American friends. This translates clearly through the body as maneuverability between embodied aesthetic states. As dancers, my partner (Suzette Sagisi) and I are able to slide in and out of dance forms and switch between the vernacular and the highly codified. In this response to Locus, I wanted to convey that we carried multiple dancing traditions within our bodies. To honor our lineage beyond concert dance, we both agreed that we identified with dancing that came from our experiences outside of the studio: from hip-hop culture, club and house dancing, to the voguing balls in Harlem and the piers in New York City, where queens flocked in the late 80s and early 90s to express their rebellion of gender and hetero-normativity. Suzette and I wanted to represent these dance forms that provided us historical context and meaning. Another thing we shared was our vague knowledge of traditional Filipino folk dances: Binasuan (the candle dance) and Tinikling (the bamboo dance). As Filipino-Americans, could we appropriate traditional Filipino folk dances since we never grew up performing them? Could we collide these dance forms together to reflect the complexities contained within our dancing bodies and the way our brown bodies immediately projected ‘otherness’ within a postmodern performance gaze? These questions formed the basis of my response to Locus. My longtime musical collaborator, Tim Russell, created a soundscape that provided a backdrop of sonic energies that allowed us to surreptitiously traverse one dance form and physical state to another. He layered rhythms of the Tinikling, with non-melodies, and sounds with silence and text – even borrowing from Alvin Lucier’s well-known sound art piece, I Am Sitting In A Room. We also turned to Jessica Hagedorn’s Dogeaters, a novel that depicted Filipino life in the 1950s and was a testament to the Filipino’s attitudes and attempts to become more Westernized. Although fictional, the book also takes a jab at the (1970s) Marcos regime especially at the way the First Lady discusses her shoe collection – referring to Imelda Marcos’ lavish collection of designer shoes. In the book was a quote from President William McKinley’s famous “Address to a Delegation of Methodist Churchmen”, where he openly talks about his opinions on how the fate of the Philippines should be determined by America’s interests. He says, “[T]here was nothing left for us to do but to take them all, and to educate the Filipinos, and uplift and civilize and Christianize them.” We used this speech and layered it onto the sound score to illustrate the fact that here were two Filipino-American dancers performing a response to this American masterwork of postmodern dance. In Taglish, we blended postmodern dance, hip-hop, house, voguing, historical text, and traditional Filipino folk dances to represent the intersectional elements present in our dancing bodies. It was curious to notice similarities between Trisha Brown’s clear, geometric forms and that of voguing’s adherence to geometric planes. The demarcated lines in the voguer’s arms and torso seem to connote a two-dimensional etching of the body in space to disidentify with gender norms – to ultimately seek freedom within (self)-imposed constraints. Inside the structured improvisations of the piece, my partner and I often played with switching our performance of gender, namely in the Binasuan, where the female’s arms accented up while the male’s arms were forced and accented downward. It was also apparent that the lines between gender were very fluid and porous, especially in the voguing sections. However, the sections performed repeatedly inside the cube, signified the inconsequential nature of gender. These negotiations were difficult to execute but necessary to include. In conclusion, I turn to one of the reviews that came out of this experience, from Allan Ulrich who writes, “What binds Gerald Casel’s 'Taglish' to Brown remains a mystery, but the choreographer and Suzette Sagisi provided some of the fleetest dancing of the evening. Casel notes that the piece represents tensions between Filipino and American culture, but his finely crafted mirror duet was satisfying in itself.” His writing misses the mark altogether, even glossing over the tension between Filipino and American culture. He instead focuses on what he deems legible and worthy of affirming: the mirror duet. The fact that he is mystified by my response is not a surprise, however, the fact that his white, male gaze cannot register any of the elements that portrayed voguing embodied in my whirling effeminate gestures, the traditional Filipino folk dance, and the blending of vernacular and postmodern dance underscores his incapacity to include other forms of dance beyond his narrow definition. Ulrich’s response sheds a light on the invisibility of colored people’s culture to mainstream dance criticism that privilege Western and Eurocentric dance forms and unfortunately perpetuates the mechanisms of coloniality. In dance criticism, words, like actions, have power. When critics use (or do not use) words to describe culture beyond white space, they basically ignore and in effect, erase, the culture they think they describe.